The effects of different applied water amounts on the behavior of parameters derived from trunk diameter fluctuations were studied during three consecutive seasons (2004 to 2006) in a mature vineyard planted with Vitis vinifera cv. Tempranillo and cv. Cabernet Sauvignon in Albacete (Castilla-La Mancha, Spain). Maximum daily trunk shrinkage (MDS) was calculated from trunk diameter fluctuations. The response of MDS to different irrigation treatments varied in the amplitude of the signal between the two cultivars. Tempranillo MDS was significantly higher than that of Cabernet Sauvignon in the period before veraison for the three years. MDS decreased in magnitude after veraison regardless of irrigation treatment and tended to be similar in the two varieties, except for one year where there were cultivar differences in yield caused by differential effects of a frost. Irrigation treatment differences in MDS were significant in 2004 and 2005 at pre- and postveraison, while in 2006 they were nonsignificant, possibly due to the very low yield caused by a late frost which differentially affected the cultivars, suggesting that yield level may be another factor to consider when attempting to use MDS for irrigation management. It appears that the use of trunk diameter sensors for irrigation scheduling in winegrapes would require a specific calibration for the different cultivars. The adoption and use of plant-based measurement sensors in agriculture has increased in recent years as a result of technological advances and a greater focus on the spatial management of crop inputs. Sensors for plant monitoring which were originally developed for research applications are increasingly being used for commercial irrigation scheduling (Jones 2004). Among the plant-based techniques, the use of trunk diameter variations as an indicator for irrigation scheduling has been proposed (Huget et al. 1992, Goldhamer and Fereres 2001). Depending on crop and cultivar, plants can exert a significant degree of control over their water status by adapting their responses to soil moisture availability and evaporative demand. Hence, plant-based sensors, which either directly measure plant water status or the response of the plant to the imposed conditions, have, in theory, an advantage over other scheduling methods as they provide some integrated measure of the plant’s reaction to both soil moisture availability and evaporative demand. Variations in stem diameter as an indication of plant water status have been a topic of study (Klepper et al. 1971). Linear variable differential transformers (LVDT’s) are currently used to measure the daily diurnal change of stem diameter (Cohen et al. 2001). These sensors measure the change in tissue water status that occurs during the day. Stem shrinkage is the result of the water loss and the reduction in turgor in the phloem and cambium tissues as a result of redistribution of water in response to the imposed water potential gradient (Dobbs and Scott 1971, Molz and Klepper 1973). The basis for the use of LVDT sensors and trunk or scaffold diameter measurements in irrigation scheduling is that trunk shrinkage increases more when the tree is under increasing levels of water deprivation. During the course of a day, the trunk of a tree deprived of water will shrink more in the midday and correspondingly will expand more during the late night and early morning hours of recovery. Therefore, maximum daily shrinkage (MDS) has been proposed as a signal to indicate the level of plant water status when using LVDT sensors to measure trunk or scaffold diameter (Huguet et al. 1992, Goldhamer and Fereres 2001). The high-frequency LVDT measurements easily detect the maximum and minimum trunk or scaffold diameter that occurs each day and the difference is calculated as the MDS. The use of MDS for irrigation management has been tested in fruit trees (Goldhamer and Fereres 2001, Moriana and Fereres 2002, Marsal et al. 2002, Fereres and Goldhamer 2003, Intrigliolo and Castel 2006b, Velez et al. 2007). In general, the results in the works cited above confirmed that MDS increased with increasing water deficits (Garnier and Berger 1986) and protocols were formulated to establish guidelines for irrigation scheduling based on MDS measurements (Goldhamer and Fereres 2001). In grapes, there has been less work (Myburg 1996, Intrigliolo et al. 2005, Intrigliolo and Castel 2007, Selles et al. 2008), even though there are commercial applications available. One problem in using trunk diameter sensors is the plant-to-plant variability in measurements. In Tempranillo field-grown grapevines, water potential (Ψ) determination had a much lower variability and was more sensitive to water restrictions than MDS and trunk growth rate (TGR) (Intrigliolo and Castel 2007). The ability of both indices to detect plant water stress varied widely depending upon phenological period. For MDS and TGR, researchers were only able to detect clearly vine water stress during the period before veraison (Intrigliolo and Castel 2007). Trunk diameter fluctuation (TDF) depends on many factors, including phenological state. For young trees, TGR could be a better indicator than MDS (Goldhamer and Fereres 2001, Moriana and Fereres 2002, Intrigliolo and Castel 2007). TDF is affected by plant age (Goldhamer and Fereres 2001, Moriana and Fereres 2002), crop load (Moriana et al. 2003), crop management, and degree of water stress, as has been reported for almond (Goldhamer and Fereres 2004), peach (Marsal et al. 2002), olive (Moriana and Fereres 2002), and grapevine (Intrigliolo and Castel 2007). One issue that has not been explored is whether MDS responses to water deficits vary among cultivars of the same species. For grapevines, differences among varieties in their responses to water deficits could affect irrigation scheduling (Schultz 2003); therefore, given the recent interest in using LVDT sensors for continuous monitoring vine water status, it would be useful to know whether irrigation scheduling based on TDF can be used in grapevine regardless of varietal differences. The objective of this study was to evaluate the use of TDF for irrigation scheduling of two winegrape cultivars. Different watering regimes were established in Tempranillo and Cabernet Sauvignon to obtain the range of vine water status needed for the assessment of the technique. This study was carried for three years, from 2004 to 2006, at Las Tiesas farm, Albacete, Spain (lat. 39°3′31″N; long. 2°6′04″W) at an altitude of 695 m. Albacete is in Castilla-La Mancha, located in the middle of the Iberian peninsula, occupying the greater part of the vast and uniform plain. Field trials were conducted in a Vitis vinifera L. (cvs. Tempranillo and Cabernet Sauvignon) vineyard. Vines were planted in 1999 on 110R rootstock at a spacing of 3 x 1.5 m. Vines were pruned to two, 10-node fruiting canes, according to standard practice. The trellis consisted of 1.7 m long aluminum post separated 6 m in the row with four vertical wires. The basal wire at 0.4 m aboveground supported the pipeline, the next wire at 0.8 m aboveground supported the fruiting canes, and two more wires at 1.1 and 1.3 m aboveground supported the canopy. The soil is classified as Petrocalcic Calcixerepts (Soil Survey Staff 2006). Average soil depth of the experimental plot was 0.4 m, limited by the development of a more or less fragmented petrocalcic horizon. Soil texture is silty-clay-loam, with 13.4% sand, 48.9% silt, and 37.7% clay, with a basic pH. The soil is poor in organic matter and in nitrogen, with a high content of active limestone and potassium. The upper and lower limits of available water in this soil were estimated based on soil texture. The water content at field capacity and at wilting point were 0.34 m3 m−3 and 0.21 m3 m−3, respectively. The climate is semiarid continental with 320 mm of annual rainfall, mostly concentrated in spring and fall. Weather parameters during the experiment were measured daily with an automated meteorological station located in the plot. Reference evapotranspiration (ETo) was calculated using the FAO56 Penman–Monteith equation (Allen et al. 1998). Budbreak for Vitis vinifera in this area occurs around the end of April; flowering, at the beginning of June; veraison, at the beginning of August; and harvest, by mid-September. A randomized complete block design with four replications was used. Each plot consisted of 24 vines (8 vines x 3 rows), with the middle eight used for experimental measurements and the remaining as nonexperimental guard vines. Vines were drip-irrigated with 3.5 l h−1 emitters spaced every 0.5 m. Water meters were installed to measure the amount of water applied to each plot. Irrigation was applied at night (2100 hr). Water usage (ETc) by the grapevines was measured with a monolithic weighing lysimeter (3 x 3 m and 1.7 m in depth) installed in the middle of a 1 ha plot located next to the field trials (Montoro et al. 2008). The total mass of the lysimeter exceeded 18.5 t. The lysimeter was weighed with a balance-beam scale and load cell configuration, with most of the weight compensated by using a counterweight. The overall resolution of the system was 250 g or 0.03 mm of water. Sampling frequency was 1 sec, and a reading was registered every 15 min by a datalogger (CR10X, Campbell Scientific, Logan, UT). Treatments in 2004 consisted of a full irrigated control (T1) and two deficit irrigations (T2, T3). T1 applied 100% ETc as measured in the weighing lysimeter; T2 applied 33% ETc; and T3 was irrigated with 60% ETc when midday leaf water potential reached −1.3 MPa. Treatments monitored for MDS in 2005 were T2 and T3 and in 2006 were T1 and T3. Starting in 2004, the trunk diameter variations were measured with LVDT sensors (model 2.5 DF; Solartron Metrology, Bognor Regis, UK). Sensors were installed in two plants per cultivar on similar trunk diameters (26 ± 5 mm average diam) and in the three irrigation treatments. The sensors were fixed on the vine trunk, 25 cm aboveground. They were oriented northward and mounted on holders made of aluminum and Invar, an alloy of iron and nickel with minimal thermal expansion. Measurements were taken every 30 sec, from which 10-min average values were calculated and stored on a CR10X datalogger (Campbell Scientific Ltd.) connected to an AM16/32 multiplexer (Campbell Scientific). In 2005 and 2006, the continuing measurements were carried out through the same methodology but, given the plant-to-plant signal variability, sensors were installed in four plants per cultivar and only in two irrigation treatments. Shrinkage rates were derived from TDF data. MDS was calculated as the difference between the daily maximum (MXTD) and the daily minimum (MNTD) trunk diameters as described in Goldhamer and Fereres (2001). Vine water status was determined by weekly measurement of water potential with a pressure chamber between early July and harvest, with the pressure chamber technique (Scholander et al. 1965). Leaf (Ψl) and stem (Ψs) water potential were determined around solar noon on exposed and bagged leaves covered with aluminum foil for at least 20 minutes before taking the measurements, on two leaves per vine, and two vines per treatment. For the Ψl measurements, leaves were enclosed in plastic bags prior to excision and readings were taken within a few seconds to minimize leaf water loss during the measurement. Analysis of variance (ANOVA) was performed using SPSS statistical software (version 10.0; SPSS Inc., Chicago, IL). Simple linear regression analysis was carried out to explore relationships among parameters, and significance levels of the correlation coefficient at 5% or higher are reported. ETo, rainfall, and cumulative water applied in each treatment are shown (Figure 1), with substantial differences among the in-season rainfall of the three years. Rainfall amounted to 114 mm in 2004, 29 mm in 2005, and 73 mm in 2006. In 2004, two of three treatments (T2 and T3) were similar at the end of the season, but before veraison T3 had 70% less water supply than the control (T1) and 20% less than T2 (Figure 1). In 2005, T2 and T3 were initially similar and the treatments differences appeared after veraison. In 2006, T3 received 30% less water than T1 throughout the season. 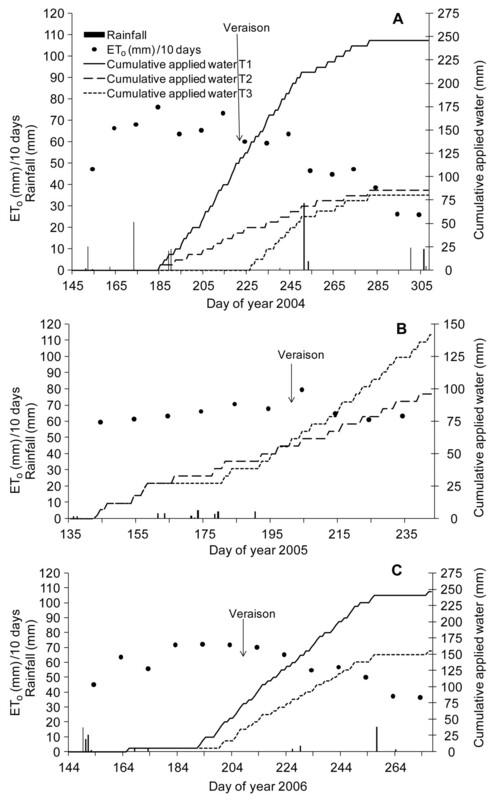 Reference evapotranspiration (ETo, mm/10 days), rainfall (mm), and cumulative applied water (mm) for 2004 (A), 2005 (B), and 2006 (C). Tempranillo MDS was greater than Cabernet Sauvignon MDS for the three years of study (Figure 2). 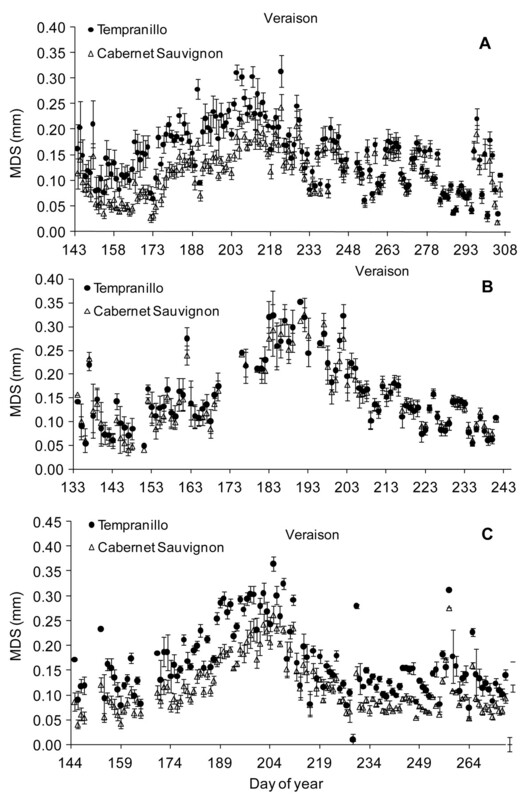 Tempranillo MDS oscillated between 0.10 and 0.30 mm at preveraison and Cabernet Sauvignon MDS had lower values, mostly between 0.05 and 0.20 mm, which in 2005 both varieties reached similar values. After veraison, the MDS of both varieties decreased relative to the values observed in the previous phase, but in Tempranillo MDS decreased more than in Cabernet Sauvignon, leading to similar values for both varieties, except in 2006. The standard deviation (SD) of the measured values in Tempranillo and the decline in MDS around veraison was generally higher than in Cabernet Sauvignon (Figure 2A, B). Maximum trunk shrinkage (MDS) for Tempranillo and Cabernet Sauvignon in 2004 (A), 2005 (B), and 2006 (C). Data are the mean of six plants in 2004 and eight plants in 2005 and 2006. Bars indicate standard deviation. At preveraison, Tempranillo MDS was greater than Cabernet Sauvignon MDS by ~35%, 15%, and 42% for the three years of the study (Figure 3). The MDS values at postveraison of for both varieties were similar in the two first years of study. In 2006, Tempranillo MDS at postveraison was 36% higher than Cabernet Sauvignon MDS. Relationship between MDS of Cabernet Sauvignon and MDS of Tempranillo for the preveraison (A, C, E) and postveraison (B, D, F) periods for 2004, 2005, and 2006. Linear regression forced through the origin is depicted in graphs. Differences between varieties were significant (p < 0.1) in 2004 and 2006; in 2005, they were significant (p < 0.5%) at preveraison but not statistically significant at postveraison. Nevertheless, Cabernet Sauvignon had lower values than Tempranillo in 2005 (Table 1). Average MDS at preveraison for Tempranillo ranged from 0.175 mm in 2004 to 0.202 mm in 2006. By contrast, average preveraison MDS of Cabernet Sauvignon fluctuated between 0.130 and 0.156 mm during the three years. Analysis of variance and Duncan test of the MDS of each variety at pre- and postveraison in 2004, 2005, and 2006 (n = number). Irrigation treatment effects on MDS. Stem water potential for treatments over the three years are shown (Figure 4). Average values indicate differences in Ψs for each irrigation treatment. In 2004, the rate of full irrigated control (T1) did not exceed −0.6 MPa for the whole season, and the lowest value (−1.15 MPa) occurred around day of year (DOY) 220. The same Ψs was recorded earlier (DOY 190 and 200, respectively) in 2005 and 2006. Stem water potential (Ψs) for different irrigation treatments in 2004 (A), 2005 (B), and 2006 (C). Data are the mean of six plants (three per cultivar). Bars indicate standard deviation. Regression analysis of Ψl over Ψs is shown (Figure 5). 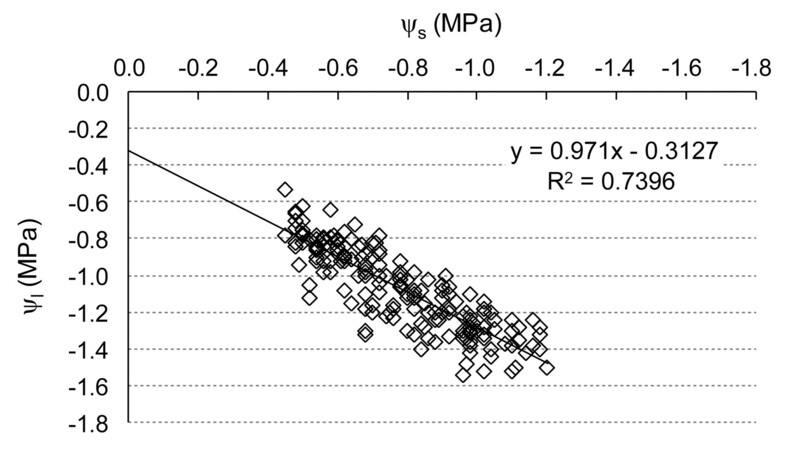 The coefficient of determination (R2 = 0.74) was highly significant (p < 0.001). Stem water potential differed between the two cultivars and different treatments. Cabernet Sauvignon reached lower values than Tempranillo under fully irrigated conditions (Figure 6). Stem water potential (Ψs) for treatments T1 and T2 of Tempranillo and Cabernet Sauvignon in 2004. Bars indicate standard deviation. Irrigation treatment differences in MDS were significant (p < 0.1) in 2004 and 2005 at pre- and postveraison. In 2006, no significant differences between two irrigation treatments were detected (Table 2). MDS increased with water deficits; in 2004, average MDS for both varieties at preveraison was 0.137 mm for the fully irrigated treatment and 0.183 mm for the deficit irrigation treatments. In 2005, the average MDS for the deficit irrigation treatment was 0.204 mm and was only 0.167 mm for the control. The values at postveraison were generally lower than at preveraison in all irrigation treatments for the three years of study. Analysis of variance and Duncan test of MDS for each irrigation treatment at pre- and postveraison in 2004, 2005, and 2006 (n = number). As water deficits increased, the differences in the MDS between varieties also increased. The MDS differences between Tempranillo and Cabernet Sauvignon were less in the fully irrigated treatment (T1) (Figure 7A) than in T3 (Figure 7C). 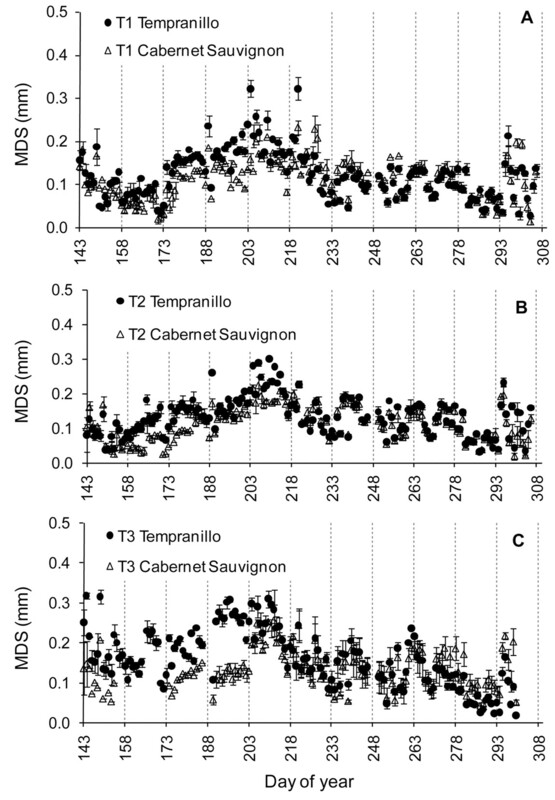 Maximum trunk shrinkage (MDS) for Tempranillo and Cabernet Sauvignon for treatments T1 (A), T2 (B), and T3 (C) in 2004. Data are the mean of two plants. Bars indicate standard deviation. Relations between MDS, vapor pressure deficit, and grapevine water status. Contractions of trunk diameter are a function of evaporative demand, with contractions and expansions occurring when transpiration was above or below the soil absorption rate. Before veraison and in both varieties studied, trunk expansion occurred between 1600 and 0800 hr. Contractions of the trunk began when vapor pressure deficit (VPD) reached ~1.3 KPa between 0800 and 0900 hr (Figure 8A). Trunk contractions around veraison, however, commenced when the VPD was between 0.25 and 0.5 KPa (Figure 8B). Variations in trunk diameter fluctuation (MDS) and vapor pressure deficit (VPD) during selected days in 2006 for. Tempranillo and Cabernet Sauvignon before (A) and around veraison (B). Even though the relationships between MDS and mean daily VPD for both cultivars in the three years were statistically significant at preveraison, the correlation was weak (R2 = 0.28), with some differences between the two varieties (Figure 9). When all data was pooled, the correlation was even weaker (R2 = 0.15). 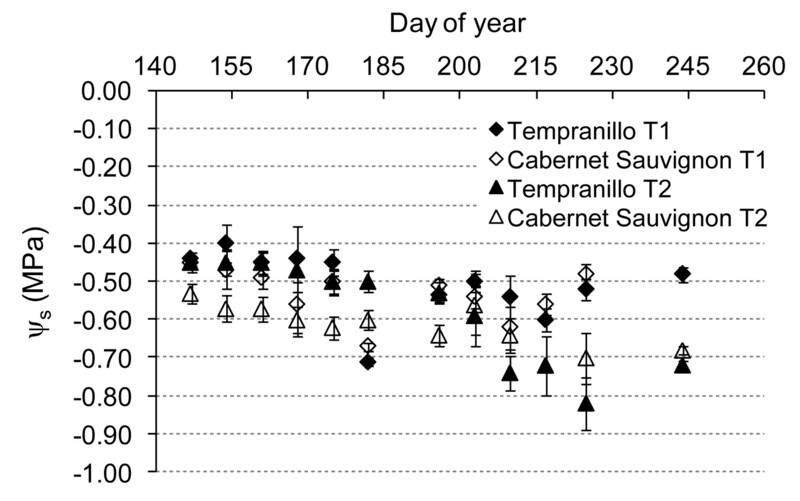 Relationships between maximum daily shrinkage (MDS) and mean daily vapor pressure deficit (VPD) for Tempranillo and Cabernet Sauvignon for the whole season (A) and at preveraison (B) for 2004, 2005, and 2006. The relationship between MDS and Ψs for Tempranillo and Cabernet Sauvignon in three years of study (preveraison) is shown (Figure 10). 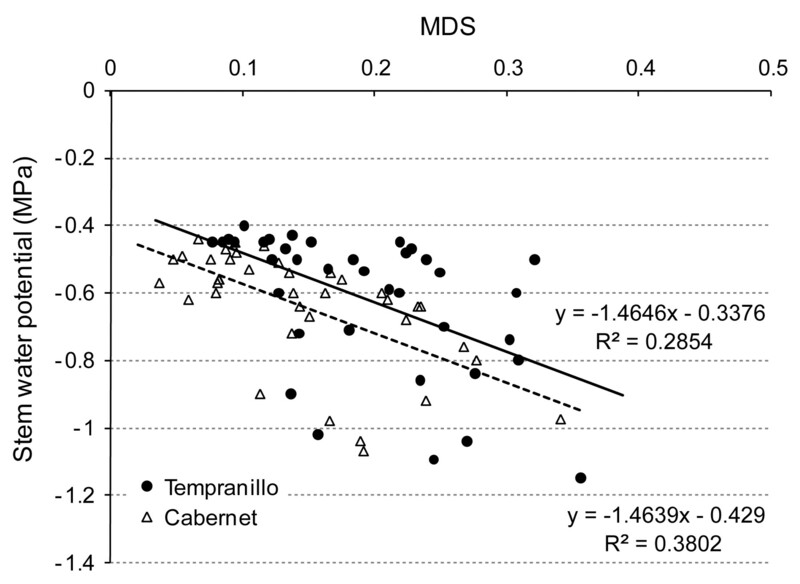 For the same level of vine water status, Tempranillo MDS was greater than Cabernet Sauvignon MDS, highlighting the varietal differences in the relations between trunk shrinkage and plant water status, although the poor correlation observed (0.28 for Tempranillo and 0.38 for Cabernet Sauvignon) has an inherent low predictive value. Relationship between maximum daily shrinkage (MDS) and midday stem water potential (Ψs) in Tempranillo and Cabernet Sauvignon at preveraison. Data from 2004, 2005, and 2006. In terms of yield per hectare, Cabernet Sauvignon was more productive than Tempranillo (Table 3). In 2004 there were no statistically significant differences between T1 and T2 in Tempranillo and T2 and T3 in Cabernet Sauvignon. In 2005, both varieties had lower yields than in the previous year, but the differences between varieties were not great. The year 2006 was the least productive because of the differential effects of a frost, with Tempranillo more affected than Cabernet Sauvignon (Table 3). Yields of the full irrigated treatment in 2004 and 2006 were approximately 11,614 and 2,756 kg/ha, respectively, for Tempranillo and 11,974 and 4,623 kg/ha, respectively, for Cabernet Sauvignon. 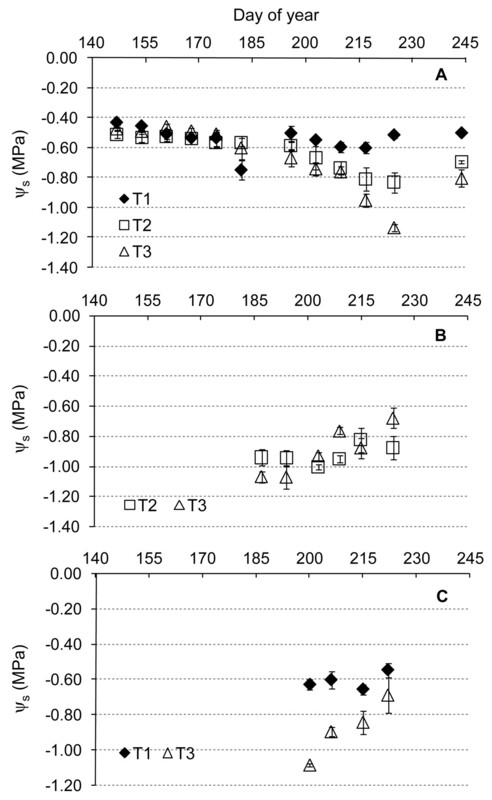 In 2006, the differences in yield between T1 and T3 for any of the two cultivars (Table 3) were not statistically significant due to the high variability among replicate plots. Yield of two winegrape cultivars under different irrigation treatments in 2004, 2005, and 2006. Diurnal changes in the stem diameter of grapevines have been documented in potted plants (Escalona et al. 2002) and in the field (Intrigliolo and Castel 2007). The seasonal trend in MDS in this study (Figure 2) confirms the pattern described by Intrigliolo and Castel (2007) with greater amplitude at the preveraison MDS than at postveraison, independently of water status. Data here shows that the MDS signal decreases about 10 days before veraison occurs (Figure 2). MDS differences between Tempranillo and Cabernet Sauvignon were consistently greater in Tempranillo for the three years of study (Figure 3). A recent, comprehensive review on the use of stem variations for irrigation scheduling (Fernández and Cuevas 2010) does not report on differential MDS responses among cultivars of the same species. The differences found in this study could not be attributed to differences in trunk diameter (Intrigliolo and Castel 2006a) because the sensors were installed in trunks of similar size. There were no obvious cultivar differences in plant size and leaf area (as assessed visually), although, unfortunately, no measurements of leaf area or pruning weights were taken. Furthermore, for the same irrigation treatment, there were no differences between cultivars in yield levels, except in 2006, due to the differential varietal response to a frost (Table 3). The cause of trunk diameter variations is discussed extensively elsewhere (Fernández and Cuevas 2010) and is related primarily to the movement of water from the phloem and other living tissues in response to water potential gradients generated by the transpirational stream. 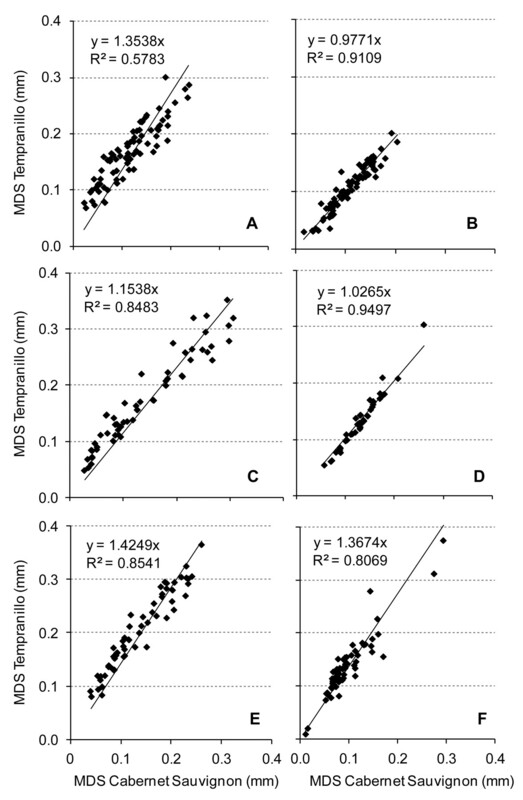 There is a reasonable positive correlation between MDS and sap flow in potted grape plants (Escalona et al. 2002). It is possible that stomatal behavior differs between the two cultivars, as intraspecific variability has been found in the stomatal behavior of a number of grape cultivars (Schultz 1996, 2003). It could be hypothesized that Tempranillo has a higher transpiration rate (and hence a higher MDS) than Cabernet Sauvignon, under the same environmental condition and plant size. 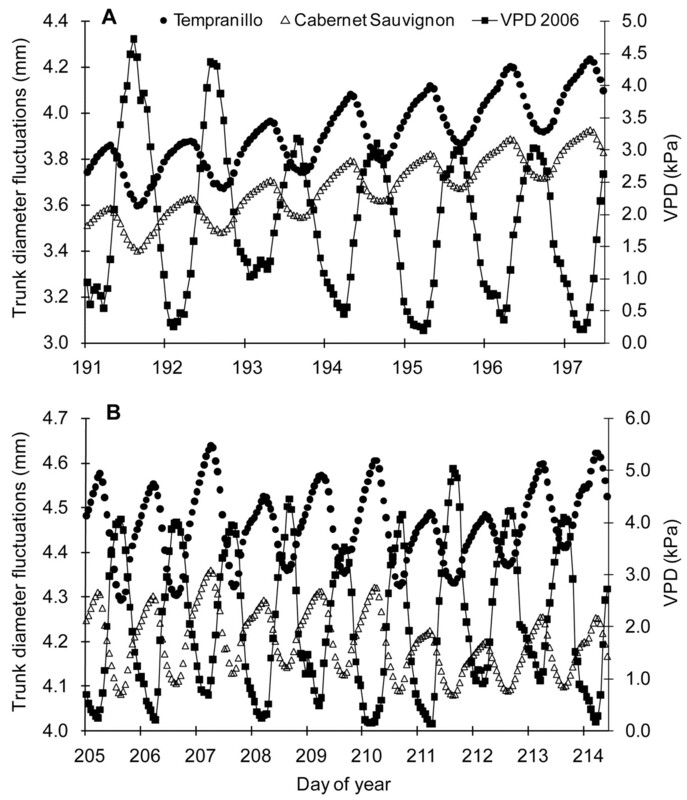 Differences in the diurnal behavior of Ψl of different grape cultivars could be related to the water-conducting capacity and/or stomatal behavior, which may respond to hydraulic or chemical signals (Fuchs and Livingston 1996, Hubbard et al. 2001, Comstock 2002). Vitis vinifera L. cultivars of contrasting genetic origin show very different responses of Ψl during water stress, which suggests that a classification into isohydric and anisohydric plants may exist in cultivars for the same specie (Düring and Scienza 1980, Schultz 1996). There could also be varietal differences in osmotic pressure between the bark and the xylem (Cochard et al. 2001), thus leading to differences in water potential gradients that would affect differences in stem contraction under the same conditions. Unfortunately, our measurements cannot uncover the underlying causes for the varietal differences in MDS. While the differential behavior between varieties was consistent during the three years of the study, after veraison in 2006 the MDS of Tempranillo was always greater than that of Cabernet Sauvignon, contrary to the response observed in the previous two years. A possible explanation is the differences in yield of the two cultivars in 2006 (Table 3). In that year, the yield of Tempranillo was much lower than that of Cabernet Sauvignon (Table 3). Thus, very low yields may be another confounding factor when standardizing the MDS signal to detect vine water status. Previous studies in fruit trees relating MDS to tree water supply (e.g., Huguet et al. 1992, Simonneau et al. 1993, Goldhamer and Fereres 2001) indicate that MDS increases with the level of water stress. Our results also confirm that MDS increased with increasing water deficits in both winegrape cultivars (Table 2), which is the basis for proposing the use of trunk diameter sensors for irrigation scheduling. In 2006, the irrigation treatment effects were not as clear, perhaps due to the very low yield caused by a freeze that particularly affected Tempranillo (Table 3). The lack of irrigation treatment differences around and after veraison might be due to the acclimation of woody tissues to cold hardiness, which includes intracellular cell desiccation and tissue lignifications. Both features, together with a decrease in tissue elasticity toward the end of season, may cause the reductions in the magnitude of MDS after veraison in winegrapes (Intrigliolo and Castel 2007). Around veraison the sugar concentration of woody tissues increases (Weyand and Schultz 2006). That should lead to a smaller water potential gradient between the phloem and the xylem and, thus, to less stem contraction for a given stem water potential around veraison. The smaller MDS differences after veraison between irrigation treatments cast doubt on the use of MDS as a sensitive water stress indicator in grapevines during that period. The low correlations between MDS and mean daily VPD for both cultivars (Figure 9) may have been due to the inherent seasonal trend of the MDS in the grapevine (Figure 2), where MDS had higher values at the beginning and the end of the season than at midseason, while VPD is generally less at the beginning and the end of the season than at midseason. 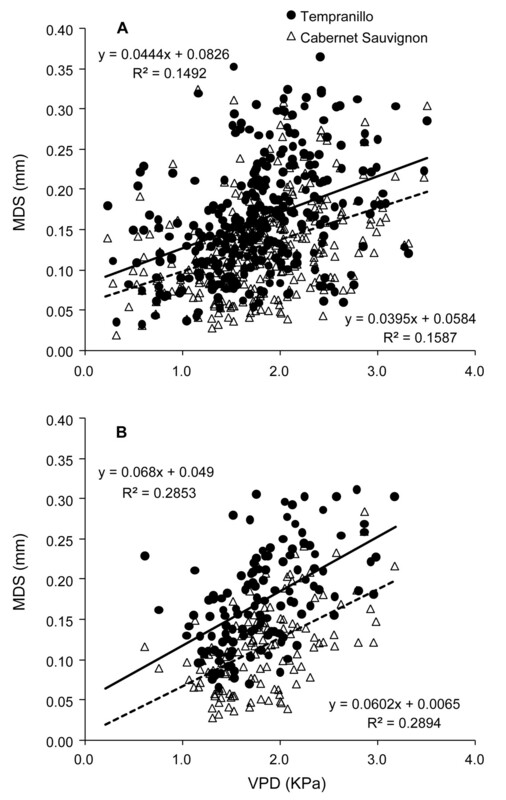 This weak correlation is another complicating factor for the use of MDS as an indicator for irrigation scheduling. Goldhamer and Fereres (2001) proposed the use of protocols based on dynamic responses to threshold MDS values for irrigation management at plot level. The differential varietal responses and the variations in seasonal trends reported here point to the difficulties in using MDS as a robust indicator for scheduling irrigation in grapevines. The maximum daily shrinkage of the stem of two winegrape cultivars subjected to different irrigation treatments varied depending on the cultivar, with greater signal amplitude in Tempranillo than in Cabernet Sauvignon for the same soil and atmospheric conditions. These differences are probably related to the degree of stomatal regulation of transpiration, which is known also to vary among different cultivars of the grapevine. The seasonal trends observed in the two cultivars showed greater amplitude in the preveraison than the postveraison period, for all irrigation treatments studied. There were very weak correlations between MDS and evaporative demand, likely due to the intraseasonal variations in the MDS of the grapevine. Although cultivar differences in MDS were statistically significant, there was substantial variability in the MDS signal, requiring several sensors to detect irrigation treatment differences. That, together with the variation between cultivars found here, limits the use of trunk diameter sensors for commercial irrigation scheduling in winegrapes. Acknowledgments: This study was financially supported by the Diputación Provincial de Albacete, Castilla-La Mancha, Spain and by INIA, project no. RTA2005-00038-C06-02. E. Fereres acknowledges the support of the Consolider-RIDECO MEC grant CSD2006-0067. A. Montoro acknowledges D. Goldhamer for instruction of the dendrometric technique.
. 1998. Crop evapotranspiration. Guidelines for computing crop water requirements. FAO Irrigation and Drainage Paper 56. FAO, Rome.
. 2001. A new validation of the Scholander pressure chamber technique based on stem diameter variations. J. Exp. Bot. 52:1361–1365.
. 2001. Assessment of peach tree responses to irrigation water deficits by continuous monitoring of trunk diameter changes. J. Hort. Sci. Biotech. 76:55–60. 2002. Hydraulic and chemical signaling in the control of stomatal conductance and transpiration. J. Exp. Bot. 53:195–200.
. 1971. Distribution of diurnal fluctuations in stem circumference of Douglas-fir. Can. J. Forest Res. 1:80–83.
. 1980. Drought resistance in some Vitis species and cultivars. In Proceedings of the Third International Symposium on Grapevine Breeding. Olmo, H.P. (ed. ), pp. 179–190. Dept. of Viticulture and Enology, University of California, Davis.
. 2002. Drought effects on water flow, photosynthesis and growth of potted grapevines. Vitis 41:57–62.
. 2003. Suitability of stem diameter variations and water potential as indicators for irrigation scheduling of almond trees. J. Hort. Sci. Biotech. 78:139–144.
. 2010. Irrigation scheduling from stem diameter variations: A review. Agric. For. Meteor. 150:135–151.
. 1996. Hydraulic control of stomatal conductance in Douglas fir [Pseudotsuga menziesii (Mirb) Franco] and alder [Alnus rubra (Bong)] seedlings. Plant Cell Environ. 9:1091–1098.
. 1986. Effect of water stress on stem diameter changes of peach trees growing in the field. J. Appl. Ecol. 23:193–209.
. 2001. Irrigation scheduling protocols using continuously recorded trunk diameter measurements. Irrig. Sci. 20:115–125.
. 2004. Irrigation scheduling of almond trees with trunk diameter sensors. Irrig. Sci. 23:11–19.
. 2001. Stomatal conductance and photosynthesis vary linearly with plant hydraulic conductance in ponderosa pine. Plant Cell Environ. 24:113–121.
. 1992. Specific micromorphometric reactions of fruit trees to water stress and irrigation scheduling automation. J. Hortic. Sci. 67:631–640.
. 2006a. Performance of various water stress indicators for prediction of fruit size response to deficit irrigation in plum. Agric. Water Manag. 83:173–180.
. 2006b. Usefulness of diurnal trunk shrinkage as a water stress indicator in plum trees. Tree Physiol. 26:303–311.
. 2007. Evaluation of grapevine water status from trunk diameter variations. Irrig. Sci. 26: 49–59.
. 2005. Water relations of field grown drip irrigated “Tempranillo” grapevines in Requena, Spain. Acta Hort. 689:317–324. 2004. Irrigation scheduling: Advantages and pitfalls of plant-based methods. J. Exp. Bot. 55:2427–2436.
. 1971. Stem diameter in relation to plant water status. Plant Physiol. 48:683–685.
. 2002. Phenology and drought affects the relationship between daily trunk shrinkage and midday stem water potential of peach trees. J. Hort. Sci. Biotech. 77:411–417.
. 1973. On the mechanism of water stress induced stem deformation. Agronomy J. 65:304–306.
. 2008. Evapotranspiration of grapevines measured by a weighing lysimeter in La Mancha, Spain. Acta Hort. 792:459–466.
. 2002. Plant indicators for scheduling irrigation of young olive trees. Irrig. Sci. 21:83–90.
. 2003. Yield responses of a mature olive orchard to water deficits. J. Am. Soc. Hort. Sci. 128:425–431. 1996. Respose of Vitis vinifera L. cv. Barlinka/Ramsey to soil water depletion levels with particular references to trunk growth parameters. S. Afr. J. Enol. Vitic. 17:3–14.
. 1965. Sap pressure in vascular plants. Science 148:339–346. 1996. Water relations and photosynthetic response of two grapevine cultivars of different geographical origin during water stress. Acta Hort. 427:251–266. 2003. Differences in hydraulic architecture account for near-isohydric and anisohydric behavior of two field-grown Vitis vinifera L. cultivars during drought. Plant Cell Environ. 26:1393–1405.
. 2008. Effect of soil water content and berry phenological stages on trunk diameter variations in table grapes. Acta Hort. 792: 573–580.
. 1993. Diurnal changes in stem diameter depend upon variations in water content: Direct evidence in peach trees. J. Exp. Bot. 44:615–621. Soil Survey Staff. 2006. Keys to Soil Taxonomy. 10th ed. USDA-Natural Resources Conservation Service, Washington, DC.
. 2007. Scheduling deficit irrigation of citrus trees with maximum daily trunk shrinkage. Agric. Water Manag. 90:197–204.
. 2006. Long-term dynamics of nitrogen and carbohydrate reserves in woody parts of minimally and severely pruned Riesling vines in a cool climate. Am. J. Enol. Vitic. 57:172–182.